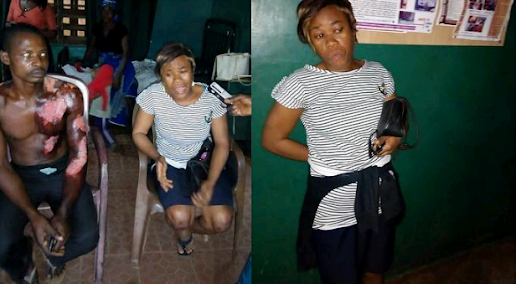 A man identified as Sunday Edona, has been hospitalised after his wife, Adaobi, poured hot water on him during a scuffle at their house. Trouble started after Adaobi, a sachet water seller, bought a N50 worth of egg for their children, while Sunday, a toothbrush seller, bought them N50 snacks without informing his wife. According to Image Maker Global, the incident happened on Wednesday 29th August, 2018 at Umuezeagu Okpuno Eze Uruagu, Nnewi, Anambra State. Angered by her husband’s decision not to tell her and thus making her waste money on egg instead of using it for another purpose, she confronted him and accused him of being irresponsible, as she is the breadwinner of the house. Sunday was said to have told her that what they bought weren’t too much for the kids and cautioned her against disrespecting him as the head of the house. However, when she continued with her verbal abuse, they went confrontational and she poured hot water on him after he gained an upper hand. Upon realizing her error, the wife started begging for forgiveness and rushed him to Ebenator hospital, where he is currently recuperating.